Does YOUR Sport Have Bloodtime?! Warren Mott's head coach Paul Salyers had a one word response to the question of how his team did at the 2016 Macomb County Invitational: "Ugh." The previous season Mott had finished in the top 12 of the county for the first time in decades. As a result, Salyers justifiably thought his team would do well this year. "I knew we didn't have the three seniors we graduated last year, but we have a pretty good group of kids this year. We just had a couple of really bad outcomes at critical moments and it hurt us big." The first day of the two day tournament started out well with the Marauders having two wrestlers alive in the championship bracket and all but one of their entered wrestlers still alive for Day Two. Michael Perkins (119) and Justin Schwemle (135) had both won twice in the first day. Gustavo DeLima (145) had one his first match and with the sixth seed overall seemed to be in good shape. Likewise, senior Nic Barnhart (285) had lost one and won one to advance to the second day. All four stood a good chance to medal in the tournament. Day Two did not go as planned, however. 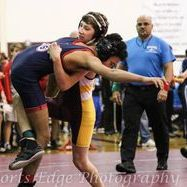 The bad news started in the blood round of the 119lb class, Michael Perkins had placed 6th at last year's tournament and was a good bet to improve on his finish with a fourth seed. Perkins was locked in a bitter battle that had gone into over time. With :20 seconds left in the first period of "sudden death" overtime, Perkins went for a quick takedown and missed, giving up the takedown and the win. "Mike went for a high risk move and it didn't work," noted Coach Jeff Pruitt. "If it had worked, we would have all been slapping him on the back and saying what a bold move it was. Unfortunately, it didn't and there is a lot of second guessing. Hopefully, he will learn from it and get better." While Schwemle and DeLima won their blood round matches and moved to the medal round, both suffered heart breaking setbacks in the consolation quarterfinals. Schwemle was up by 3 pts with :08 seconds left in a match he had dominated from the beginning. With both wrestlers on their feet, Schwemle's opponent shot in for a single. Schwemle countered with a whizzer defense, but hung his head and ended up on his back. When the dust had cleared he lost by one as time ran out. In another tragic outcome, DeLima was tied with :02 left in regulation in his consolation quarterfinal match. DeLima tried a lateral drop on the edge of the mat, apparently thinking the move would either score or take him out of bounds. Unfortunately, he stayed in bounds and gave up the 2 point takedown, losing the match. Although both DeLima and Schwemle earned medals on the day (DeLima 8th, Schwemle 7th), both wrestlers walked away wondering what might have been. "It was a tough day," Coach Salyers observed. "I really thought we would do better. I was convinced we would have at least three medalists and was hoping for five or six. These are good kids. With these type of mental breakdowns at critical points in the match, I feel like maybe I didn't prepare them well enough. It is tough." The Marauders have a few weeks to collect themselves, enjoy a Christmas holiday and then get back in action for the Roseville tournament on December 29th. The Warren Mott wrestling team hosted the Toys For Tots "Takedown In Motown" wrestling tournament on Saturday, Dec 10th. While the tournament has been running continuously for the last 21 years, this year marks the 11th year Mott has played host. Each year, the proceeds from the tournament are used to purchase toys for the annual Toys For Tots drive in Southeast Michigan. The tournament is also an exciting kickoff to the high school wrestling season, taking place each year on the opening weekend of the season. As it has for three years running, Ferndale claimed the team title with Mott coming in second place. This year only seven points separate Ferndale and Mott at the end of the night. Mott had been leading going into the finals. Leading the way for the Marauders were three of their senior wrestlers, all of whom were champions at their weights: Michael Perkins (119lbs), Justin Schwemle (135lbs) and Gustavo DeLima (145lbs). Senior Nic Barnhart (285lbs) made it the finals, but lost to ultimate tournament MVP, Tyler Anderson of Center Line HS. Junior Chris Perkins finished third at 130lbs and Senior Josh Sitek placed fourth at 160lbs, to round out the medalists for Warren Mott. 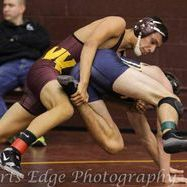 The Warren Mott wrestling team defeated Lanse Creause North HS 64-12 and Utica HS 61-18 on Wednesday night to open the 2016-17 and start the season at 2-0. Mott’s Coach Salyers was pretty happy with the effort. “We only lost three wrestlers last year, but they were three really tough kids and they will be hard to replace. Leann Abad and Kyran Daniels were both State Qualifiers for us two years in a row and Jacob Pruitt was a really experienced wrestler. It is hard to fill their shoes, but we have some really athletic and motivated kids coming into the program and we are excited to see how quickly they are improving,” Salyers enthused. Mott will have four seniors who are expected to anchor the lineup. Mike Perkins (119), Justin Schwemle (135), Gustavo DeLima (145) and Nic Barnhart (285) will all be reliable wins in the lineup for the Marauders this year. In addition, the Marauders will rely on two experienced juniors in Andrew Kakoos (125) and George Yacoob (130) to backup the seniors. The Marauders capped off a good season last year with a MAC Gold championship, a MHSAA D-I District championship and a trip to the Regional Finals, before bowing to Hartland, the eventual D-I state champs. The Marauders hope to duplicate the effort this year and then take the next step, although Salyers understands how difficult that may be. Regardless of how the season turns out, the Marauders got off to a good start on Opening Night of this 2016-17 season. 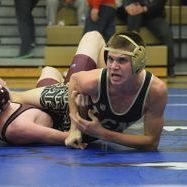 Warren Mott swept its remaining competition in the MAC Gold on Thursday night when it travelled to St. Clair HS for the final MAC dual meets of the season. The Marauders faced off first against Grosse Pointe North, the only remaining unbeaten team in the MAC Gold. The Norsemen were no longer unbeaten when they left St. Clair that night after Mott handed them a 53-22 loss. With the meet starting at 145lbs, Mott got on the board with a 15-0 technical fall by Senior Jacob Pruitt. The Marauders gave up pins at 152 and 160 to fall behind 12-5. Senior Kyran Daniels pinned his opponent to bring his team to within a point at 12-11. Mott Freshman Austin Pruitt lost the next match at 189lbs by a major decision, but in a match that became hotly contested in the third period. Pruitt's continuing efforts throughout the match motivated the team (above picture) and although GPN picked up six points for a void at 215, the Marauders swept the remaining matches. In the second dual of the night, Mott won 11 of the 14 matches against St. Clair, winning the dual 60-15. With the wins over GPN and St. Clair, Mott finished the MAC dual season with a perfect 5-0 record. The Marauders will be in action again on Saturday, February 6, 2016 at Grosse Pointe North when the Norsemen host the MAC Blue/Gold/Silver Individual Tournament. The Marauders ran into trouble in their first dual when they faced Livonia Churchill. Continuing to give up two voids in the upper weight classes and still missing Junior standout Mike Perkins (119), the Marauders fell to Churchill 43-34. After the loss to Churchill, Mott faced a MAC Blue opponent in Port Huron Northern. With only eight men in their roster, PHN only won three of the eight contested matchups and Mott rolled to a 54-18 win. Having lost their first dual and won their second dual, Mott was placed in the Silver Pool and faced a MAC White opponent in Henry Ford II. The Falcons depth of talent was obvious and the Marauders fell 50-30. On a positive note, Leann Abad avenged what had been his only loss on the season when he pinned the highly ranked Terrin Machart at 119lbs. Machart had beaten Abad badly in the semi-finals at the Macomb County Tournament. In the fourth dual of the day, the Marauders faced off against Warren DeLasalle. Although it came down the last match at 103lbs, Mott emerged victorious over DeLasalle for the first time in many years with a 44-33 win. With Mott leading 38-33 Coach Salyers told his 103lbs wrestler (and son) that he needed to win seal the deal. In truth Mott only needed their 103lber to not get pinned to win the dual, but Freshman Steve Salyers took his instruction to heart. In 1:37, Salyers pinned his opponent and locked in the win. 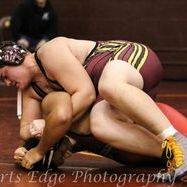 The Warren Mott Marauder Matmen travelled across the city on Thursday for the second round of MAC Gold duals, hosted by Cousino High School. The Marauders squared off against a perennially tough Clawson team in the first dual. Fourteen matches later, the Marauders emerged victorious with a 64-18 win. In the second dual, Mott faced St. Clair Shores Lakeshore. When the dust settled, the Marauders had won their second dual of the night and third of the season in the MAC Gold. The Marauders posted a 46-31 win over Lakeshore to move into a tie for first place in the MAC Gold with Grosse Pointe North. The title for the MAC Gold dual meet season will be settled next Thursday, January 28, 2016 when they will collide with Grosse Pointe North and St. Clair at St. Clair High School. 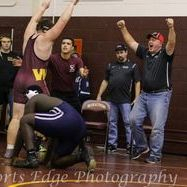 It was just an “add on” tournament to fill in an open date on the schedule, but it provided some of the most exciting moments of the season thus far for a young Warren Mott wrestling team. The Marauders improved to 6-1 in dual meet competition at the Center Line Team Tournament this weekend. The matmen dropped their first dual of the year, but the coaches were very pleased with their effort. "All I can say is 'Wow!'" gushed first year head coach Paul Salyers. "Our kids had some tough matches today and grew up quite a bit in a very short time." The Marauders came into the dual with 3-0 record in dual meet competition. They started the day off wrestling a much depleted Harper Woods squad and rolled to an easy 54-0 win. The second dual with Cesar Chavez Academy proved fairly easy as well, with CCA managing only two wins in the 14 matches and the Marauders notching a 66-12 win. Then things got interesting. The third dual in the round-robin pool wrestling was with North Farmington. Wrestling with depleted upper weights, Mott was spotting their opponents voids in the 189 and 215lbs weight classes. The Raiders of North Farmington picked up a quick 12 team points. Hoping to hold the line at 285, Mott sent out Nick Barnhart to face Zach Doran of N. Farmington. Barnhart wrestled well in the first period, but got caught early in the second period and was pinned in 2:36, tacking on another 6 points to the Raiders team score. With the Raiders having just added a quick 15 points to their team score, and two young freshman coming up to finish the dual, Mott’s coaches were concerned that a solid win was going to turn into a slim victory. “We were going to win the dual regardless of the outcome of those last two matches, but we needed to learn to close the door on our dual meet opponents and this was a good time to learn the lesson,” commented Coach Salyers. 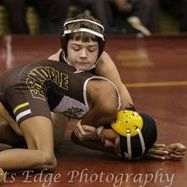 The next Marauder to take the mat was Coach Salyers’ son, Steve Salyers, the team’s 103lber. “Steve has been steadily improving, but he has a very slight build and his opponent looked like a pretty muscular kid. I was worried about what was going through Steve’s mind. I think our team was thinking the same thing, because they really got behind him with their cheering,” Salyers recalled. Steve Salyers wrestled a solid match, but when the whistle blew at the end of the third a period, a last second reversal had caused a tie and the match headed to overtime. At the end of the first period of “sudden victory” overtime, it looked like Salyers might have had a take down on the edge of the match, but it was ruled out of bounds and the match headed to second and third periods of overtime. All the while, Salyers’ teammates continued to cheer him on, growing in intensity as the match progressed. In the third period, Salyers hit a switch and scored a reversal and a penalty point to salt away the 7-4 win. His teammates went wild and mobbed the exhausted 103lber as he came off the mat. 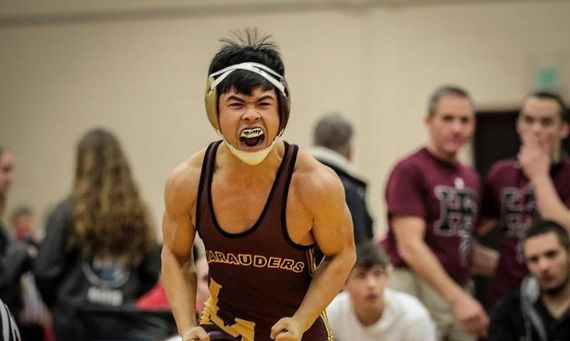 The mood proved infectious for the next wrestler, freshman Hunter Esse, at 112lbs. Esse’s match was a back and forth affair, but in the end he rolled through a head and arm and pinned his opponent, Tanig Knox, in 2:57. The two wins netted a final score of 51-21 for Mott. The Marauders enthusiasm at the end of the North Farmington dual seemed to bleed over to the next dual meet against Armada, but in the end the Marauders two voids cost them a win. Armada, which had a full squad, won a squeaker with a 39-37 victory over Mott. Four Marauders went unbeaten on the day. Seniors Leann Abad (119) and Kyran Daniels (171) were joined by underclassmen Gustavo De Lima (Jr/140) and Andrew Kakoos (So/125). [Jan 13, 2016] The Warren Mott wrestling kicked off the conference portion of their schedule by hosting rival Cousino on January 13, 2016. The Marauders, who conducted a Parent Appreciation Night ceremony before the dual, put on a good show for their loved ones, beating the visiting Patriots 54-30. Leading the way for Mott were its reliable seniors, Leann Abad (119), Jacob Pruitt (152) and Kyran Daniels (171). All three recorded pins on the night. Coach Paul Salyers was very happy with the results. “I thought this dual was going to be closer than it ended up. We won a few matches with some of our younger kids that I wasn’t sure which way they would go and that made the final score look like a bigger win,” he explained. Assistant Coach Jeff Pruitt agreed. “Cousino has a pretty good dual meet team. We were expecting this to be closer, but I am glad it wasn’t!” Pruitt added. Mott will be in action again this weekend when the Marauders take a short trip to Center Line High School to participate in the Panther’s annual 10 team tournament. When he scheduled the tournament at Sandusky (Michigan), Coach Salyers was pretty excited for the event. Salyers graduated from Sandusky High School in 1980 and it had been a while since he had returned to the school. "I wanted the wrestlers to see where I grew up. I talk a lot about lessons I learned growing up on a farm and as city kids I don't think they really understand." The Marauders got a chance to see the farmland and gage the quality of wrestling in the area. Mott ended up a (mildly) disappointing 5th place in the team competition. Clearly, they are still missing the presence of Mike Perkins (Jr/119), who remains out of the lineup. 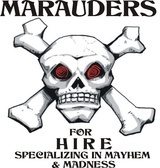 In addition, a few of the Marauders didn't quite wrestle up to their standards. "We have a pretty solid middle of the lineup," noted Salyers, "and I really thought we could get a few of our middle weights into the finals. Unfortunately, that didn't happen, but we did have a couple of our lower weights perform unexpectedly well." Mott was led by their two outstanding seniors, Leann Abad (112/119) and Kyran Daniels (171), who both finished as champions. Daniels put on his usual display, quickly pinning every wrestler he faced and adding five more wins to his record. 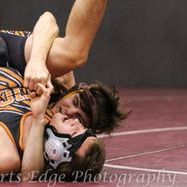 "I don't think Kyran wrestled more than two minutes total in his first four matches," said a smiling Coach Jeff Pruitt. "He was a machine today." Leann Abad also won five times as he took the gold medal. In the process, Abad had to beat Brandon Goike, a quality opponent from Armada, not once but twice. "This tournament is kind of flukey in that it allows a wrestler to lose once and still be in the hunt for first place," noted Coach Strube. As a result, Abad had to beat Goike in the early going and then again in the finals. In those all important middle weights, the Marauders had three medalists in Justin Schwemle (5th/135), Gustavo DeLima (3rd/140) and Jacob Pruitt (4th/152). "All three of those wrestlers wrestled hard and I can't fault their effort. But I knew we had to have at least two of them in the finals to do well as a team," observed Coach Salyers. Two freshman did their best to chip in and add to the team score. Steve Salyers (Fr/103) went 4-1 on the day and earned the silver medal. "Steve wrestled well today," offered Coach Rob Naismith. "He was down by points in both his second and third matches and came back to win. It was good to see him gut out some tough wins." Hunter Esse was 2-2 on the day and garnered a third place finish. "Hunter is improving and his wrestling today proved that," said Coach Strube. "He can be a tough wrestler and will be very tough if he keeps working at it." The Marauders next host rival Cousino on Wednesday, January 13th, in the first MAC Dual meet of the season. Justin Schwemle (Jr/135) came into the Spartan Classic tournament with a chip on his shoulder. He knew he had underperformed at the County Tournament a few weeks earlier and was determined that it wouldn't happen again. While Schwemle didn't win the Spartan Classic, he did have a good day of wrestling, going 4-1 on the day and finishing 5th in a field of 20 teams. "Justin wrestled very well," said Coach Paul Salyers. "I love watching our wrestlers win close matches, It means they made fewer mistakes than their opponent and capitalized on the mistakes of their opponent. It's different than scoring a quick pin. Not as exciting some times, but certainly more gratifying for a coach. I was very proud of Justin's effort on Saturday." Salyers had reason to be pleased with more than just Schwemle. Mott was without two of their reliable starters, Michael Perkins (Jr/119) and Nick Barnhart (Jr/285), but the team still managed to finish 6th in the large field. The Marauders were once again led by its seniors, Leann Abad, Kyran Daniels and Jacob Pruitt. Leann Abad (Sr/119) pinned his way through the field and coasted to a championship. Kyran Daniels (Sr/171) also took 1st place, but only after a tight finals match with Troy Athens John Staron ended in an unfortunate injury to Staron. Daniels was leading 3-2 at the time of the injury with :20 left to go in the match. Daniels was rewarded for the toughness of his finals match with the MVP trophy. Salyers. "He dug deep and pulled out the win when the chips were down. He is a dangerous wrestler and he showed why in that match. Mott also some saw of its younger wrestlers come up just short of placing in the large field. Steve Salyers (Fr/103) , Hunter Esse (Fr/112) and Goria Akash (Jr/215) all went 2-2 on the day and lost in the "blood round." Coach Jeff Pruitt acknowledged the effort, "All of our younger kids wrestled very well. It was good to see." Next up, on Saturday, Jan 9th, Mott will travel to Sandusky, Michigan to wrestle in the Redskin Invitational at Sandusky High School, Coach Salyers' alma mater. Warren Mott took only nine wrestlers to the Macomb County Wrestling Tournament this year, choosing to not enter a wrestler in 5 of the 14 weight classes. Nine wrestlers proved enough to bring home the best team finish by the Marauders in over a decade. Mott finished 13th in a field of 36 teams, which is a very respectable result for the young team. 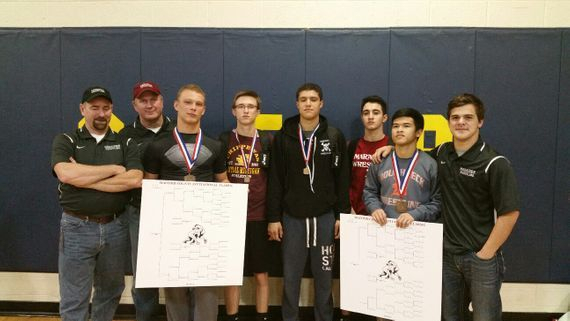 Individually, the Marauders had four wrestlers who took home hardware. Leading the way were two senior wrestlers, Leann Abad (112) and Kyran Daniels (171), both of whom finished with third place bronze medals. Abad lost for the first time of the season in the semi-finals against Utica Ford's Terren Machart, 11-1. Despite the wide margin of the score, Abad remains confident he can compete with Machart. "I can wrestle with him," he said when reminded that he will see Machart again as the season progresses. Abad wrestled back to a match for 3rd place, but his opponent couldn't wrestle due to injury. Kyran Daniels took third place at 171, but had to work a bit harder for his bronze. Daniels started the tournament with three straight pins, recording his first pin in :09. In the semi-finals, however, Daniels ran into Derrien Perkins of Warren Lincoln. Currently, Perkins is the top ranked 160lb D2 wrestler in the state. Daniels wrestled close with Perkins, but fell short 4-2. 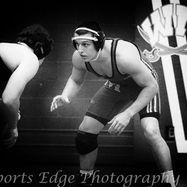 "I thought Kyran wrestled well against Perkins, but he waited too long to pick up the pace," Coach Salyers opined. "Kyran is a physical specimen and he wrestles physically, but he needs to manage the tempo a bit better against the better wrestlers. It's early, we will work on it." Daniels defeated Jon Gough of Grosse Pointe South 11-4 to move into the consolation finals and an opportunity to wrestle for third place. His opponent was Jared Roberts of Fraser. Daniels had lost to Roberts twice last year in close matches and Roberts had garnered the second seed in the tournament on the strength of those wins. The two wrested another tough, close match, but this time Daniels came out on top with a 6-4 win. Two other Mott wrestlers had good tournaments. Michael Perkins put on an impressive display at 119lbs en route to picking up a 6th place medal. Perkins drew a bye in the first round before losing in the second round to eventual 4th place winner, Alex Backers of L'Anse Creuse. In an impressive comeback, Perkins then rolled off four straight wins before falling to eventual 3rd place medalist, Alex Barrett of Dakota. Perkins lost again in the 5th/6th place match. Despite his last two losses, Coach Strube said, "Mike had a great tournament and wrestled extremely well on his feet. He is capable of wrestling at a higher level than he sometimes does and it all seemed to come together for him this weekend." Gustavo De Lima also medaled, taking 8th place at 140lbs. De Lima won his first match and dropped his second match, but wrestled tough in the consolations, reeling off three straight wins before losing again and falling into the 7th/8th place match. In his final match, De Lima wrestled well, but came just short of the win. "Another wrestler worthy of mention is senior Jacob Pruitt at 145lbs," commented Coach Strube. "Jake came within one match of placing, which would have been great." Pruitt didn't wrestle last year for personal reasons and is still rounding into form this year. "I look for good things from Jacob before the year is done," Coach Salyers noted. "We are still early in the season and we have a lot of work to do. All in all, though, it was a very good early season gut check." The Marauders are in action next on January 2nd at Fitzgerald High School where they will compete in the Spartan Classic, a sixteen team individual tournament. The Macomb County Wrestling Tournament is a very tough tournament. So tough, in fact, that each year many younger wrestlers go there and lose twice so quickly that they get very little experience. As a result, the Macomb County Wrestling Coaches Association launched a "County - B" tournament for newer or younger wrestlers. Since the competition is not as stiff, the wrestlers get more mat time and the coaches get a chance to evaluate their up and coming talent. 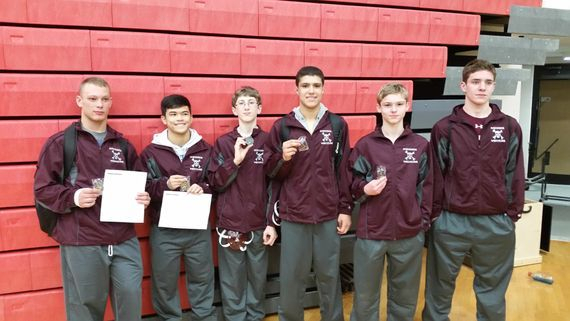 On Saturday, December 19th, Warren Mott sent 16 wrestlers to compete at the Macomb County B Tourney at Sterling Heights HS. The Marauders did very well with 12 out of 16 place winners. Leading the way was freshman Shane Kuebler, who easily won the 140lbs weight class. 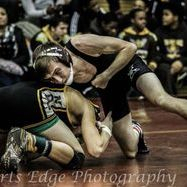 Shane Kuebler, Mott's only champion, looks to step up to a varsity spot in the lineup as the season progresses. 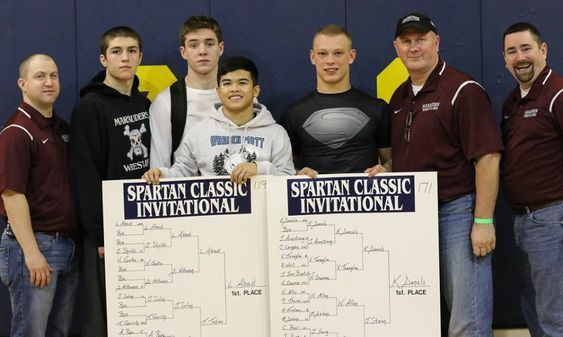 Although Kuebler was the only champion, the Marauders had four other wrestlers in the finals who ended up taking second place in their weight class. Freshmen Hunter Esse (112), Stephen Rushanchin (160) and Alex Kuebler (171) all were Runners-up in their weight classes. Joining them with a silver medal was junior Goria Akash (215lbs). Four more Marauders brought home the bronze medal for third place: Freshman Steve Salyers (103), junior Ryan Hester (140), Daniel Karzcmarczyk (145), and Rudy Capodacqua (171). Although they didn't earn medals, which were only given out through 3rd place, three other Marauders took 4th place: Freshmen Connor Fitzgerald (125), Dakota Jones (145), and Austin Pruitt (189). Coach Salyers was pleased with the effort. "I am very impressed with our tenacity and conditioning. Most of these wrestlers are very young or in their first year of wrestling and have a lot to learn, but all in all it was a very good showing!" 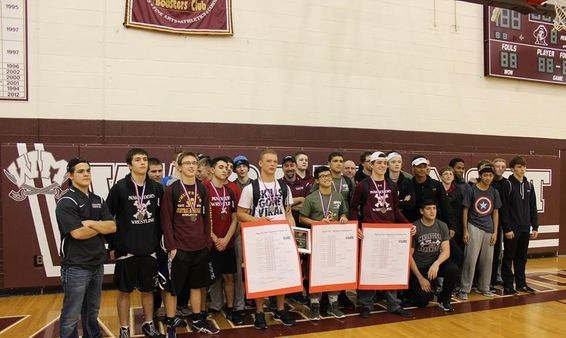 Warren Mott hosted the Twentieth Annual Toys For Tots' Takedown In Motown Wrestling Tournament on Saturday, December 12, 2015. The tournament was a huge success with hundreds of toys donated for the annual Toys For Tots toy collection drive, while the spectators enjoyed an excellent display of high school wrestling. The team competition came down to two teams, host Warren Mott and returning team champion Ferndale. In the end, Ferndale edged Mott by 9 points, 206-197. Stoney Creek was third with 178 points. Warren Mott was led by senior Leann Abad, who was 4-0 on the day at 112lbs. Abad was named the tournament's MVP by a vote of all coaches. Also winning championships for the Marauders were fellow seniors, Jacob Pruitt (152lbs) and Kyran Daniels (171lbs). Mott had a fourth wrestler in the finals. Gustavo DeLima (140lbs) came up just short of a championship when he lost to Tate Larson of Sandusky, 5-0. Other place winners for Mott: Michael Perkins 3rd at 119lbs; Justin Schwemle 3rd at 135lbs; Andrew Kakoos 4th at 125lbs; Steve Salyers 5th at 103lbs; Josh Sitek 5th at 152lbs; and Shane Kuebler 6th at 145lbs. For full details of Mott Wrestlers, click on the link below. A very young Warren Mott wrestling team knocked off LCN (72-12) and Utica (45-27) tonight. Very pleased with the kids, especially the new wrestlers. I was asked what are our goals for the year and didnt have to think for a second. "Be a better wrestler today than we were yesterday." I think the rest will take care of itself. 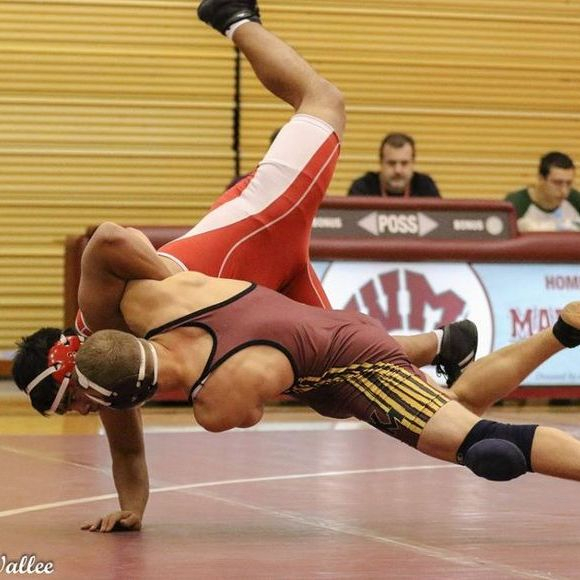 Warren Mott wrestlers rebounded nicely from a disappointing loss at the Team Districts on Thursday night. After falling to UofD in the District final, the Marauders moved on to the Individual District tournament at Birmingham Groves where each wrestler competes individually to move on in the post-season tournament. 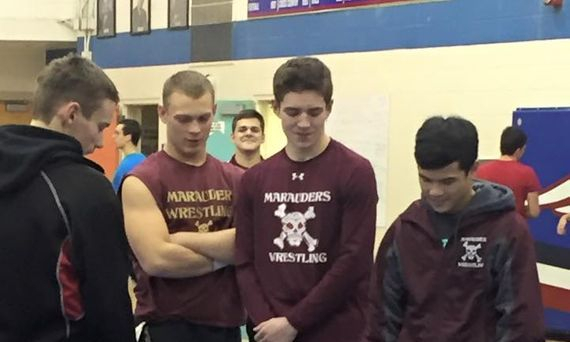 Since becoming Warren Mott, the most wrestlers the Marauders have advanced to the Individual Regional in a single year is five...until now, that is. On Saturday, the Marauders captured a District title at 285lb, a second place finish at 103lb, a third place finish at 171lb and three fourth place finishes at 135lb, 152lb and 160lb. Senior Kyle Gray (285lb) was 3-0 on the day and avenged his only loss of the season in the finals when he defeated Jim Frohlich of Fraser 4-2. Getting the opportunity for a re-match was no picnic, either. As a result of the previous loss to Frohlich, Gray was seeded second behind Frohlich and had to beat Reggie Lewis in the semi-finals. Gray, Frohlich and Lewis have all been ranked in the top ten in the state in this year's Michigan Grappler rankings. Joining Gray at Regionals next week will be freshman Garett Strube (103), junior Quentin Soard (171), junior Matt Jundy (135), senior Rafi Razzouq (152) and junior Evan Pugh (160). Warren Mott hosted the Team District tournament on Thursday night. Mott drew the bye in the three team district, but ended up losing to UofD Jesuit in the final, 40-36. With wrestling starting at 119lbs, Mott fell behind through the middle weights and after the 152lb match was trailing 31-6. Beginning a rally at 160lbs, Mott won five of the next six matches by pin to take the lead 36-34 with one match left to wrestle. Although Mott's 112lb freshman wrestler fought hard against a more seasoned veteran from UofD, Mott ultimately lost the match and the dual. The Marauders are in action again on Saturday when they head into the Individual District tournament at Birmingham Groves. The top four finishers will move on the Individual Regional tournament at Plymouth Canton HS on Saturday, February 19, 2010. Amidst a snow storm and building excitement for this year's SuperBowl, Warren Mott played host to the MAC Blue tournament on Saturday. The Marauders had hoped to improve on their 3rd place dual meet finish, but were nothing if not consistent, finishing 3rd behind tourney champs, Lakeshore, and runner-up, Marysville. The outcome may have been different for Mott if it had had its full lineup, but one of the key Marauders failed to make weight after being seeded first in the tournament. Nonetheless, Mott wrestlers stuck gold twice and just missed gold twice. The Marauders also captured two third place medals and three fourth place finishes. Details on the tournament will be posted soon....stay tuned! After a barn-burner of a match against WCS rival Cousino on Thursday night when Mott squeaked out a narrow victory, the Marauders came out a bit flat on Saturday at the Harper Woods team tournament. Mott drew Cousino in the first round of the tournament and came up short, falling to the Patriots 48-27. Head Coach Gary Skop was trying a new lineup for the Marauders as they prepare for the post-season, but the effort was hamstrung by the loss of Thursday night's hero, junior Tyler Truski, who was out with the flu. In addition, Cousino's coach, Grant Syswerda juggled his lineup by moving Anthony Nitecki up to 130lbs to face Mott's Matt Jundy. The move paid off with Cousino winning both the 125lb and 130 lb matches. Meanwhile, Cousino reversed its loss at 135lbs with Anthony Ticconi catching Brett Rodzos in a haymaker of a headlock to earn the fall. Rodzos had a 7-2 lead at the time. The result wasn't pretty and Mott was down 39-0 before senior Rafi Razzouq put Mott's first points on the board. After the loss to Cousino, Mott regrouped and ran off three straight wins against Southfield, Harper Woods and Chippewa Valley's B team. Mott was also scheduled to wrestle UofD Jesuit at the tourney, but with the two teams destined to meet in a week at the Team District Tournament, both coaches opted to forego the contest. Mott will be in action next when it hosts the MAC Blue JV and Varsity tournaments on February 4th and 5th. 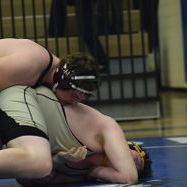 The Warren Mott wrestling team sauntered into Lakeshore HS for the second round of MAC Blue duals with the clear thought they could knock off Fraser for the second time this season and compete with league leader Lakeshore. A few hours later, a much subdued group of Marauders slunk out of LHS with their tails tucked firmly between their legs, having been spanked twice by their MAC Blue foes. The Marauders were....not so good. Nuff said!! 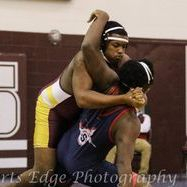 The Warren Mott wrestling team ventured into the friendly confines of Fitzgerald High School with grand aspirations and high hopes. The young team was on a roll and seemed to be poised to compete for the title of the always tough Spartan Classic, Fitzgeralds sixteen team individual tournament. The team came up short, though, finishing 5th in the team scoring. The high school Marauders travelled to the newly renovated Lincoln High School to compete in the Warren City Team Tournament on Wednesday, December 22, 2010. Overall, Mott went 3-2 on the day despite giving up three voids due to illness and injury at 119lbs (Jalen Marion - flu) and 145lbs (Tyler Truski - muscle strain). Mott dropped the first dual meet with Warren Woods Tower 46-24 and then followed up with a close loss to Center Line 35-40. The Center Line dual came down to the last match before the dual was decided. 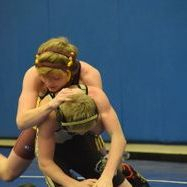 Mott rebounded in the third dual, defeating rival Cousino 47-24 and then followed up with a 54-15 route of Fitzgerald. Mott finished the day with a 48-27 victory over East Detroit, bringing the Marauder season record to 8-3. Individually, the Marauders were led by freshman Garret Strube (103lbs), junior Evan Pugh (171lbs) and senior Kyle Gray (285lbs), all of whom were 5-0 on the day. Juniors Matt Jundy and Quentin Soard were both 4-1 for the tournament, while senior Rafi Razzouq and sophomore Brett Rodzos were each 3-2. The WMHS matmen finished the first day of the Macomb County Tournament with nine of eleven wrestlers still competing. The Marauders were led by senior Kyle Gray, junior Matt Jundy and freshman Garret Strube, all with two wins a piece and still competing in the championship bracket. Gray, the third seed at 285 lbs, won his first match by default before pinning his second round Center Line opponent. Jundy, the eighth seed at 130 lbs, pinned his first round opponent from Harper Woods and then moved on to face ninth seed Adam Cross of Center Line. In a well wrestled match, Jundy capitalized on every opportunity to win by technical fall, 19-4, and move on to the quarter finals. At 103 lbs, fourth seed Garret Strube, pinned both his opponents, Chris Hulul of New Haven in the first round, and Chase Davis of Port Huron in the second round. Six other Marauders are still alive in the consolation bracket. Each of the following wrestlers are 1-1 and will be wrestling in the first round on Saturday morning when wrestling resumes at 9:00 am: So. Brett Rodzos (135), Fr. DeShawn Burley (140), Sr. Rafi Razzouq (152), Jr. Evan Pugh (171) Jr. Quentin soard (189) and So. Matt Debski (215). 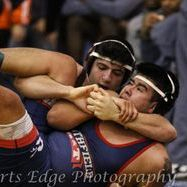 Check out http://metrograppler.com for updated brackets on Saturday, or follow a live blog on http://michigangrappler.com, or better yet, take a trip out to the Silverdome and cheer on the Marauder high school wrestlers. 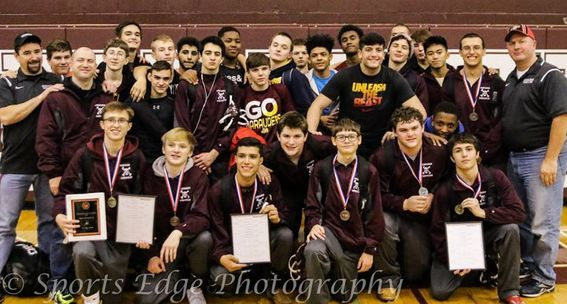 Warren Mott wrestlers walked into the Troy Athens Duals knowing that they would perform well as a team, but thinking that they might be a bit young to make any real noise. With only two seniors on the team, the Marauders surprised themeselves and their competition, going 4-0- and winning the team championship at the Athens Duals. The Marauders beat Troy Athens 51-22, Fraser 44-36, U of D 55-24, and Southfield 51-30. While every Marauder pitched in at critical times during the four different duals, six wrestlers won all four of their matches: Garett Strube (103), Matt Jundy (130), Brett Rodzos (135), Evan Pugh (171), Quentin Soard (189) and Kyle Gray (285). 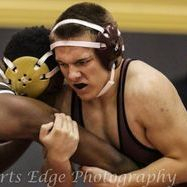 The Warren Mott Marauders split a pair of duals at with L'Anse Creuse on Thursday, December 2, 2010, to open the season. 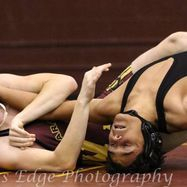 The Marauders dropped the first dual against the Crusader's A team, before rebounding to defeat the LC-B team. 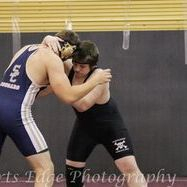 Garett Strube (103) and Kyle Gray (285) won both of their matches and led the Marauder cause on the evening. Warren Mott's wrestling team attended the L'anse Creuse duals at L'anse Creuse High School on Thursday, December 3, 2009 and split a pair of duals. The Marauders were short five wrestlers who could not wrestle their intended weights because of Alpha Weight restrictions, but still managed to defeat their first opponent, Grosse Pointe South, 37-33. Mott gave GPS 30 points from the voids, but won every match wrestled except one. Mott's second opponent proved to be a too difficult to overcome the voids and the Marauders succumbed to host L'anse Creuse 58-14. The Marauder matmen then moved into the weekend during which they hosted the fourteenth annual Toys For Tots Takedown In Motown tournament. The Marauders finished third as a team in a field of fifteen. Nine Mott wrestlers placed in the top six of the tournament. Full results are available at the following link. Kyle Gray - The Friendly Giant!! Scott Riley led all Marauders this past week by posting two wins in league dual meet action and claiming first place at Fitzgerald's Spartan Classic Tournament. 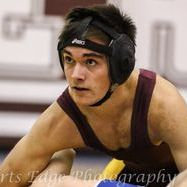 The Warren Mott Marauders split a pair of league duels on Thursday night when it wrestled Fitzgerald and Cousino. Mott fell to Fitzgerald for a second time this season, losing 25-50, in the first meet of the evening. Although the loss was by a substantial deficit, Mott did improve over its first loss to Fitzgerald. In the second meet of the night, Mott posted a big win over rival Warren Consolidated school, Cousino, 51-20. Mott had lost its duel meet with Cousino in a close meet at the City Championship on December 23rd, which made the victory Thursday night that much sweeter. Despite the lopsided score against Fitzgerald, Mott had several bright spots during the evening. Senior Dan Salyers posted two more wins on the season, moving his record to 23-0 and garnering his 100th career victory. Senior Scott Riley and Junior Anthony Best also posted double wins, with Best knocking off Macomb County 4th Place finisher, Charles Carroll of Fitz (6-4) at 215 lbs. Best's match against Carroll was a thriller. With the pair knotted at 4 and time running out in the third period, Best scored a takedown with :03 left to knotch the victory. Best's match preceded another barn burner as Sophomore Kyle Gray came close to victory over County Runner-up Justin Walters of Fitzgerald in the 285 lbs class. Gray had Walters on his back twice, but couldn't pin him and Walters ended up prevailing in the end. In the Cousino match, Mott posted several wins that had gone the other way in the earlier meeting of the two teams. 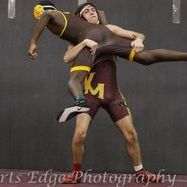 At 125 lbs Junior Tommy Jenkins pinned his opponent, as did Freshman Tony Perryman at 130 lbs. Sophomore Rafi Razzouq also pinned his Cousino opponent in a reversal of fortunes from the earlier meeting. Coach Gary Skop acknowledged that his team is improving. "As a young team, it's not necessarily surprising that we would improve, but the kids are catching on quickly and if they keep it up, good things could happen for us. It also helps to have [Senior Devon] Williams down to weight at 189 lbs. If he had been there for our earlier duel with Cousino, we might have won that meet as well." Skop is still looking for Senior Ryan Upton to re-join the team at 130 lbs. Upton has been sidelined with health issues for the past week. The Marauders are next in action on Saturday, January 10th at the Spartan Classic at Fitzgerald High School. The fifteen team tournament begins at 10:00 am. Warren Mott hosted the Toys For Tots' Takedown In Motown! tournament for the third consecutive year on December 6, 2008. The fourteen team field was led by Center Line, last year's runner-up, who won the tournament with 189 points. Center Line was followed by runner-up De La Salle, third place Detroit Catholic Central - B, and fourth place Warren Mott. The level of competition was increased dramatically with the addition of several teams, including Catholic Central's B team and Davison. In addition to excellent competition, the tournament collected approximately 350 toys for the local Toys For Tots program and generated revenues sufficient to donate approximately $1,250.00 to Toys For Tots once all bills were paid and all fees were in. Individually, the Marauders were led by Senior Dan Salyers at 145 lbs, who won the tournament for third year in a row and captured the MVP for his second consecutive year. Senior Devon Williams also won gold for the Marauders at 215 lbs, beating Marauder teammate Anthony Best in the finals. Other Marauders of note were freshman Tommy Jenkins who finished 5th at 125 lbs, Scott Riley 3rd at 135 lbs, Ray Masciopinto at 140 lbs, and Kyle Gray, who finished third at 285 lbs by beating fellow Marauder Steve Detkowski in the consolation finals. 12-1 Toys For Tots Champions!